JUSTIN C. MANN, deceased, was born in Lorain County, Ohio, in 1821, a son of Enos and Sarah Mann, both of whom were natives of Massachusetts. They settled in Adams County, Indiana, in 1836, where our subject grew to manhood. He was married August 22, 1846, to a Mrs. Reynolds, who was a daughter of Vachel H. and Sarah (Henry) Ball, pioneers of Adams County, who came from Virginia, and were of English ancestry. Mrs. Mann was born in Delaware County, Ohio, April 9, 1818, and was brought by her parents to Adams County when thirteen years of age. At the age of eighteen she was married to John Reynolds, who died on their farm in Root Township in 1843, and by him she had four sons and two daughters, all of whom yet survive, and are living in Nebraska and Indiana. Eight children have been born to Mr. and Mrs. Mann - Mrs. Eliza Knoff, of Wood County, Ohio; Mrs. Mary Woodward, of Logansport, Indiana; Vachel F., of Decatur; Mrs. Cornelia Elzey, of Decatur; Joseph K., of Decatur; Justin E., of Meade Center, Kansas; Ida May, and Jesse E., a physician of Decatur. After his marriage Mr. Mann settled on a farm that is now within the corporate limits of Decatur. In 1858 he removed to a farm in Washington Township, adjoining Decatur, where he died in the spring of 1884. He was a member of the Methodist Episcopal church for many years, and one of the old and respected citizens of the county. Mrs. Mann, who still survives him, is a resident of Decatur. She is also a member of the Methodist Episcopal church. LEWIS EDWARDS, one of the self-made men of Adams County, engaged in farming on section 15, Blue Creek Township, is a native of Fayette County, Pennsylvania, born April 2, 1815, a son of Isaac and Elizaboth (Traer) Edwards, natives of the State of Pennsylvania, the father of Welsh and the mother of English descent. Our subject's educational advantages were limited to the rude log cabin subscription schools of that early day. He was reared to the avocahon of a farmer, which he has made the principal avocation of his life. He was engaged in making fanning mills for three years. In 1822 he was brought to Jefferson County, Ohio, by his mother, remaining there two and a half years. The family then removed to Guernsey County, Ohio, and there our subject grew to manhood, remaining on the same farm in that county for forty years. He was married in Guernsey County in 1838, to Elizabeth Wilson, who was born in that county February 27, 1819, a daughter of Jesse and Rachel (Reed) Wilson, who were of Irish and Welsh descent. To this union were born the following children -- Rachel E., born in 1839, is the wife of Samuel Hastings; Martha, born in May, 1842, died September 25, 1872; Elizabeth M., born April 4, 1845, died January 17, 1886; Hannah H., wife of William Nutt, was born in 1847; William, born in 1850; Mary C., born in 1853, is the wife of Henry Merriman; Samantha, wife of Martin Suhm, was born in 1856; Lewis R., born October 15, 1858, and Horace G., born in 1863. In 1865 Mr. Edwards came with his family to Adams County, Indiana, and has since been a resident of the county. He has held the office of justice of the peace for a period of nineteen years, and has also served as township trustee and school director. In politics he is Republican and Independent, voting for the man whom he considers best fitted for office. He and his wife are members of the United Brethren church, and his mother in her religious faith was a Quaker. JESSE ELSWORTH MANN, M.D., oculist and aurist, was born in Decatur, Adams County, Indiana, August 18, 1863, a son of the late Justin C. Mann. He was reared and educated at Decatur, attending the schools of his native city until 1879. In that year he was obliged to leave school on account of failing health, when he took charge of his father's farm near Decatur, remaining tliere two years. In the fall of 1881 he began the study of medicine under the preceptorship of S. G. Hastings, A.M., M.D., at Decatur. In 1882 he took a special course of lectures on anatomy at the medical college at Fort Wayne, Indiana and in the fall of the same year he entered Hahnemann Medical College, of Chicago, Illinois, from which institution he graduated with the degree of M. D., February 22, 1884, after taking two full and one extra course of lectures. Immediately after his graduation he began the practice of medicine at Decatur, being associated with Dr. Ph. D. Paul, of Chicago, and makes professional visits to various places in Indiana. Dr. Mann was united in marriage, at Chicago, April 28, 1885, to Miss Nettle J. Holden, of Topeka, Kansas, a daughter of Edwin C. and Mary L. (Richardson) Holden. Mrs. Mann was born in Buffalo, New York, but was reared principally in Minnesota and Iowa, living longer at Sioux City, Iowa. She graduated from the high school of Topeka, Kansas, in the class of 1882, and subsequently took a course in medicine at the Hahnemann Medical College, and graduated as M. D. in the class of 1885. GEORGE A. BUNNER is a native of Pennsylvania, born near Uniontown, Fayette County, October 16, 1841, a son of Enoch and Eliza (Archbold) Bunner. His great-grandparents, John and Margaret Bunner, came to the United States, the former from Germany and the latter from Ireland, and settled in Monongalia County, Virginia. His grandparents were John and Sarah (Carl) Bunner, natives of Virginia, the latter of Irish descent. Their son, the father of our subject, was born in Virginia March 28, 1806, and December 6, 1836, married Eliza Jane Archbold. Their family consisted of seven children - Eugenius, born September 30, 1837; James William, born November 28, 1839, died December 22, 1840; George Alexander, born October 16, 1841; Sarah Frances, born April 9, 1844, now the wife of J. B. Needham, of Lamar, Barber County, Missouri; Mary Catherine, born March 31, 1847, married W. H. Beal, and died March 22, 1882; John Randolph, born April 2, 1850, died November 23, 1854; Enoch Edgar, born February 23, 1854, died September 19, 1860. When George Bunner was three years of age his parents moved to Adams County, Indiana, and settled in St. Mary's Township, on a tract of school land. They built a frame house, which at that time was the best in the neighborhood, and by hard work acre by acre was cleared until the entire farm was under good cultivation. George Bunner remained with his father until his marriage, when he settled on a farm of thirty-three acres which he had bought with money earned in the school-room. He lived on this farm four years and then sold it and bought one of his father-in-law, where he lived six years. This farm he improved, and after selling it bought the homestead of his father, which he sold four years later to the Chicago & Atlantic Railroad Company for $4,518, and bought a fine farm of eighty acres joining the town of Rivare. His residence is a neat and commodious brick building and his other improvements are comfortable and convenient. He also owns a house and lot in the village of Rivare. At present he is conducting a grocery and provision business in Rivare, and is also postmaster. His father, who now lives with him, has been an active citizen of the county. He served two terms as township trustee, and has been circuit judge of the county. He has lived an honest, upright life, and has since his youth been a member of the Methodist Episcopal church, in which he has for twenty years been a trustee. Mr. Bunner was married April 21, 1868, to Phoebe Wade, a native of St. Mary's Township, born March 6, 1848, a daughter of George and Hannah (Hank) Wade. Her father was born December 9, 1819, and died Septetuber 10, 1873. Her paternal grandparents, William and Nancy Wade, were of Welch and English ancestry, and her maternal grandparents, John and Rebecca (Apple) Hank, were Germans. Mr. and Mrs. George Bunner have four children - Enoch Alexander, born November 14, 1869; William Henry, born January 31, 1872; Lucy Bealle, born September 21, 1877, and Harry Schrock, born May 2, 1880. In politics, like his father, Mr. Bunner is a Democrat, and he and his wife are members of the Methodist Episcopal church. JOHN CHRISTEN, SR. farmer, owns forty acres of land on section 16, and eighty acres on section 15, Root Township, making a total of 120 acres. He was born in Canton Berne, Switzerland, August 9, 1812. He was reared on a farm, but later in life carried on a bakery. He was married Ju]y 17, 1835, to Miss Elizabeth Schaad, who was born January 17, 1814, in Canton Berne. The family came to America in 1850, landing in New York, coming thence to Adams County, and settling on the farm they now occupy and own. The land was partly improved. A log cabin and a log stable had been built, and about fifteen acres had been cleared. The family lived in that one room for nine years, when the father built an addition of logs, giving them two rooms on the ground floor, besides an upper room, it being a one and a half story house. The logs were hewed, both for the addition and the original house. The present fine brick house was built in 1875, and it is as good a house as there is in the township. His nice frame barn was built about 1869. Mr. Christen's parents were John and Elizabeth (Segerzer) Christen, who were born in Switzerland, and passed their lives there. Mrs. Christen's parents, Andrew and E]izabeth (Christen) Schaad, were both born in Switzerland, and died in the canton of Berne. Mr. and Mrs. Christen have had twelve children, eight of whom are living - Godfrey, born November 21, 1836; Eliza, born January 5, 1839; John A., born November 23, 1840; Mary A., born May 8, 1843; John, born October 5, 1844; William, born August 2, 1846; John R., born November 7, 1849; Anna C., born April 20, 1855. All except the last named were born in Switzerland. The deceased are - John, born November 16,1835, and died at the age of nine weeks; Mary A., born March 22, 1842, died at about the age of two months; Robert, born in March, 1848, died at the age of six weeks; Edward, born in 1852, died at about the age of five months; Emily, born October 7, 1837, died when one year old. Mr. Christen had two sons in the army, Godfrey and Albright. Godfrey served in the Forty-seventh Infantry, and Albright in the Eighty-ninth. The former was promoted to Captain while in the service. Mr. Christen has served as township trustee for ten years. He is a Democrat in politics, and belongs to the German Reformed church. See John's photo and his wife, Elizabeth's, photo. JOHN E. CULLY, founder of the Geneva Herald, and a member of the firm of A. Cully & Son, was born in Mercer County, Ohio, October 30, 1867, son of Adam Cully, before mentioned. He attended the high school at Geneva, also the Eastern Indiana Normal School two terms. He became his father's partner in business in the spring of 1884, and is at present teaching school in District No. 3, Hartford Township, Adams County, Indiana. ADAM CULLY, member of the firm of A. Cully & Son, dealers in agricultural implements, was born in Crawford County, Ohio, October 16, 1842, a son of Thomas and Mary (Lyons) Cully, the former a native of Lancaster County, Pennsylvania. He removed with his parents to Crawford County, Ohio, in an early day. His grandfather, Thomas Cully, was a native of Ireland, born near Dublin, and came to America soon after the war of 1812, settling in Lancaster County, Pennsylvania, where he lived until his death. They had only one child - the subject of this sketch. Mr. Cully served as justice of the peace eighteen years; was a farmer by occupation. Adam Cully was reared on his father's farm, and received a common school education. He remained at home until August, 1862, when he enlisted in Company E, Forty-sixth Ohio Infantry, serving until the 1st day of June, 1865, when he was discharged by reason of expiration of term of service. He joined the Fifteenth Army Corps and served under Logan. He was in a number of battles and skirmishes, the more important being Vicksburg, Jackson, Mission Ridge, Atlanta, Dalton, Snake Creek Gap, Alton, Dallas, New Hope Church, Noonday Creek, Little and Big Kenesaw Mountains, Savannah, Chattahoochie, Ezra Chapel, Jonesboro, Lovejoy, Griswoldsville, Bentonville, and was in Sherman's march to the sea. He was also at the grand review at Washington. He received a gunshot wound in the left arm at Kenesaw Mountain, and was present at Chattahoochie July 22, when McPherson was killed. At Atlanta, July 28, they captured the rebel colors, the Seventieth and Forty-sixth Ohio regiments being among the front ranks. Before his term of service expired he was promoted to Corporal. On receiving his discharge he returned to his home in Ohio, and was engaged in the stock business three years, then followed farming awhile. In 18__ he removed to Marshall County, Indiana, and engaged in the grocery trade, and in November, 1874, he came to Geneva, Adams County, and followed the same business until 1879, when he engaged in his present business, with J. D. Hale as partner. In 1882 he purchased his partner's interest and conducted it alone, until March, 1884, when his son became associated with him. Mr. Cully married Elizabeth Harrod, a native of Hardin County, Ohio. Mr. Cully has been unfortunate in business on account of trusting many who have not paid him. He thought all others were as honorable in dealing as himself. His advice to his fellow merchants is to be on the lookout, as they had better have their goods on their shelves than bad accounts and notes. Mr. Cully is perfectly honorable, always keeping his word to the letter in every business deal. MARK MILLS McCONNELL, deputy sheriff of Adams County, is a native of Adams County, Indiana, born in Monroe Township April 23, 1846, eldest son of Hon. John and Lucinda (MeDermeit) McConnell, who were old settlers of Adams County, the father coming here in 1840, and the mother in 1838. Mark M., our subject, from his fourth year was reared at Decatur, and was educated at the schools of Decatur at the Vermillion Institute at Haysville, Ohio. On becoming of age he studied dentistry at South Bend, Indiana, and afterward practiced at Decatur for two years. Dentistry not agreeing with his health, he abandoned it in 1870, after which he was employed as brakesman on the Pittsburgh, Fort Wayne & Chicago Railroad until 1871. He then followed farming in Adams and Allen counties until 1877, when he was engaged in the maunfacture of wagons and carriages until 1882. In that year he was made deputy sheriff by Sheriff Michael McGriff, and also held the same positon nuder his successor, Perry A. Lewton, who was elected sheriff in 1886. In politics Mr. McConnell affiliates with the Democratic party. He has been twice married. He was first married to Miss Samantha J. Grim, at Decatur, September 6, 1868, who died at Fort Wayne in 1871, leaving one child, Maggie, who is a student at the Decatur High School. Mr. McConnell was married a second time at Decatur, December 29, 1872, to Miss Rachel Elzey, whose parents, Elisha and Comfort A. (Whitehurst) Elzey, were pioneers of Adams County. Mr. McConnell is a charter member of Kekionga Lodge, No. 65, K. of P., of Decatur, of which he has passed all the chairs, and is a member of the Grand Lodge of the State of Indiana. John McConnell, the father of our subject, was born in Butler County, Ohio, January 20, 1819, of Irish parentage. He was the eldest of a family of three children, and his father dying when he was six years old, the care of his mother and a sister devolved on him, the youngest sister dying in infancy. He was early in life inured to hard work, beginning at the age of ten years to drive oxen on a brick yard, for which he received the small sum of 6 1/4 cents a day. When seventeen years old he worked at the blacksmith's trade for Henry Dillon for $3 per month. After coming to Adams County he obtained a farm of 100 acres, a part of which he entered, and purchased the remainder. He was married July 10, 1845, to Lucinda McDermeit, a native of Pennsylvania, who is still living, making her home in Root Township, near Monmouth. They were the parents of six children. In his political views the father was a staunch Democrat. He was a prominent and influential man in Adams County, and held many public offices. He served three years as county commissioner, and for nine years was county auditor, and was clerk of the circuit court for four years. In 1872 he was elected to the Indiana State Legislature, and served with satisfaction to his constituents during the special session of 1872 and the regular session of 1873. JOSEPH T JOHNSON, an old settler of Adams County, was born in Tuscarawas County; Ohio, August 7, 1834, a son of James and Eliza Johnson, the former a native of Pennsylvania and now deceased, and the latter a native of Montgomery County, Maryland. The parents came to Adams County in 1837, settling on section 19, Washington township, where the father entered 160 acres of land, having paid the Government $1 per acre. He first built his log cabin, then commenced to clear his land. His first crop was five acres of corn, and the next year he raised some wheat. Later he removed to section 14, Washington Township, which is the farm now occupied by his son J. T. Johnson. He endured many trials and hardships, and for many years was obliged to go to Fort Wayne to do his marketing. He also had to go to that point for his bread stuffs. With mature years came prosperity, and he became widely known and universally respected. He was a member of the Methodist Episcopal church, and one of the founders of that church in this county. Before a church building was erected his home was frequently used for services. He always took great pains to accommodate the itinerant minister. His demise occurred in October, 1853. The parents had five children, of whom two are living - Joseph T. and Leonard W. Our subject was reared to manhood in this county, and assisted his father in clearing the farm. He was married May 18, 1858, to Miss Minerva Reynolds, born August 15, 1840, in this county, daughter of John and Rachel Reynolds, the former now deceased. Her parents were among the first settlers of this county, locating on section 26, Root Township, in September, 1827. Mr. and Mrs. Johnson have had ten children - Willis M., Rachel E., Florence A., Eliza J., Edwin J., Sarah E., Charles W., Rosa A., Edna E. and Cora M. Mr. Johnson owns a good farm of 100 acres in a good state of cultivation. In politics he is a Democrat. WILLIAM ERWIN, farmer and ex-teacher, section 21, Union Township, was born in that township April 7, 1858. He has been reared in this county and was educated in the common schools of his father's district, and the normal school of Adams County. He has also taught sixteen months in the common schools of his township and eleven and one-half mouths in the district where he now resides. His father, David Erwin, was born in Trumbull County, Ohio, August 15, 1817, and was reared and educated in Guernsey and Clarke counties. Soon after his first marriage he came to this county and entered forty acres of land on section 9, from the Government. In the fall of 1839 he built his round-log cabin, 16x20 feet, and one story in height. He was first married in Ohio, to Miss Mary McCrum, who was born in that State. She died in 1855, leaving one child - Joseph T., who died July 19, 1886, of consumption. He left a wife and one daughter, nineteen years of age. May 22, 1856, the father married Mary E. Need, who was born in Carroll County, Ohio, October 4, 1836. When a young girl her parents brought her to Union Township, this county, where she was married. She died June 23, 1880. The father's family was the second family in Union Township. He served as a teamster in the Seminole war in Florida, going with a drove of mules. While there he drove team for several months for the army, although he was not an enlisted man. Both father and mother were members of the Methodist church, and died in the Christian faith. The grandfather of our subject, William Erwin, was born in Westmore land County, Pennsylvania, January 3, 1788, and died July 13, 1845, in Allen County, Indiana. The grandmother Erwin died April 7, 1856, before our subject was born, and he has no knowledge of her birth, but she also died in Allen County. His maternal grandfather, Solomon Need, died in Union Township, this county, and his grandmother, Catherine Need, died in Allen County. Both are buried in Clark's Chapel cemetery. William Erwin, our subject, was married December 23, 1879, to Miss Sylvia Stahr, who was born in Hancock County, Ohio, September 5, 1859, and when she was a child her parents brought her to Adams County and settled on section 21, where her father has lived ever since his arrival. The father, Frederick Stahr, was born in Gernany, September 8, 1832, and came to America when eighteen years old, settling near Akron, Ohio. From there he went to Hancoek County, and in 1862 came to this county. The mother, Eve (Swartz) Stahr, was born in Pennsylvania, December 31, 1835, and when a child was brought by her parents to Hancock County, Ohio, where she was married. There are three children in their family, of whom Mrs. Erwin is the oldest, and the only one living. The parents are living, and their farm joins that of our subject. There were ten children in the family of Mr. Erwin's father, eight of whom are living, and William is the oldest. Mr. and Mrs. Erwin have had two children - William Edwin, born February 3, 1882, and Arthur Frederick, born October 1, 1884, died May 18, 1886. Mr. Erwin is a Democrat in politics, and both are members of the Evangelical Association. ADAM A. MASON, grocer at Geneva, was born in Fairfield County, Ohio, April 22, 1839. His father, Joseph Mason, was a native of Maryland, and the mother was a native of Pennsylvania. They went to Ohio with their parents, where they were married. The father was a tanner by trade, which he followed in Ohio until 1847, when he removed with his family to Jay County, this State, settling on a farm on section 34, Bear Creek Township. He remained there about nine years. His wife, formerly Sarah Konkie, died in Wabash Township, Adams County, in February, 1859. The father afterward re-married and went to Ohio, where he died in the spring of 1867. They had fourteen children, Adam being the fifth child. He remained at home until after the breaking out of the war of the Rebellion, and August 8, 1861, enlisted in Oompany C, Thirty-ninth Indiana Infantry, and veteranized into the Eighth Cavalry in March, 1863. He participated in all the battles from Atlanta to the sea; was at the surrender of Johnston at Raleigh, North Carolina, where he was thrown from a horse and sustained injuries from the effects of which he draws a pension of $2 a month; he also received a gunshot wound. He served until the close of the war, and was mustered out of the service at Lexington, North Carolina. Upon receiving his discharge he returned to Adams County and engaged in farming, which he followed until September, 1882, when he embarked in the grocery trade at Geneva, which occupation he still follows. Mr. Mason is a member of the John P. Porter Post, No. 83, G. A. R. He has been married three times. His first wife was Mary Jane Ruble, whom he married in 1863, and who died March 13, 1869. 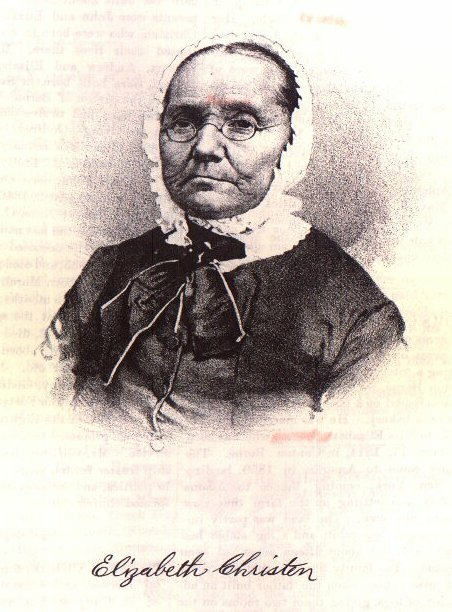 His second wife, whom he married July 21, 1871, was Sarah F. Beohm, who died January 1, 1882. To this union six children were born - William Arthur, Jessie Siloam, Frederick M., Harry Carlton, Nellie and Mamie, deceased. Mr. Mason was married January, 1883, to Hester H. Houdasetel, and to this union have been born three children - James E., Earle and Georgia Estella. Mr. and Mrs. Mason are members of the United Brethren church. JOHN ROBERT CHRISTEN, deputy auditor of Adams County, Indiana, is a native of Switzerland, born in Canton Berne, near the City of Berne, December 7, 1849. When an infant he was brought to the United States by his parents, John and Elizabeth Christen, they locating in Root Township, Adams County, Indiana, and there our subject grew to manhood. His being a farmer, he was reared to the same avocation. He received a good common school education in the schools of his neighorhood, and on attaining the age of twenty years he began teaching in the schools Adams County, which he followed six or seven winter terms, and during the summer worked on his father's homestead, being thus engaged until 1879. May 8, 1879, he was married near Decatur to Miss Edith M. Fonner, who was born and reared in Root Towi ship, her parents, John A. and Elizabeth (Pillers) Fonner, being pioneers of Adair County. Two children have been born to this union, whose names are - Otto Guy, born February 29, 1880, and Frederick Allen, born March 24, 1884. In June, 1879, Mr. Christen was made deputy auditor under his brother Godfrey Christen, and was appointed deputy auditor by his successor, Lewis C. Miller, in 1883, which position he has filled for the past eight years. 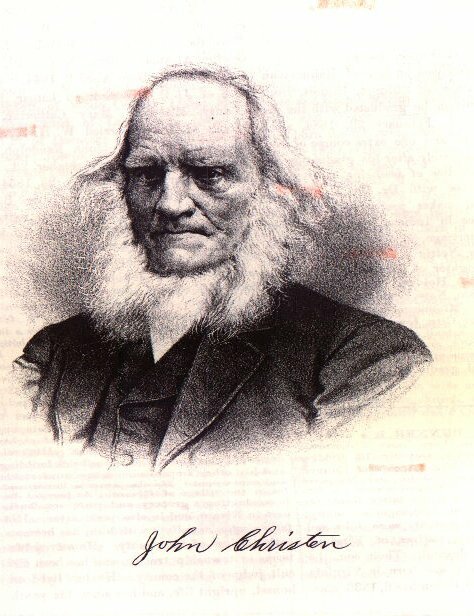 Mr. Christen was reared in the faith of the German Roform church, but now attends the Methodist Episcopal church at Decatur, of which his wife is a member.